Dr. Banjo | Can't find people to jam? Think “no one where I live is into bluegrass”? Or “I’m not good enough to play with anybody.” Maybe you're wrong. Someone may live near you, just as interested, no more skilled, but like you, a closet player. How would either of you know about the other -- even if you met them somewhere, or lived two houses from each other? You can often find that person if you try. As a new picker I used to try all sorts of ways to meet jammers, even in unlikely areas. Something always worked! In any community in the United States, a bit of scouting will probably pay off. Here are some time-tested ways of finding the picking partners you're compatible with. Look around to see who else has an instrument but isn't playing. Get up your nerve and strike up a conversation around the subject, "Is that a guitar in that case? How come you're not playing? They're too fast/advanced for me too. I'm new to this. Do you know Will the Circle Be Unbroken, or Worried Man Blues?" Suggest going elsewhere to start a slower jam. Have some easy well-known songs picked out, in case the other person doesn't want to sing. Invite other wallflowers along. What if I can't find a jam? You can also go on Google, and search "bluegrass jam [your state or city]" or just "bluegrass music [your state]". "I was in Maine last week. We pulled into a beach parking lot to take a walk and when I got back, a couple of guys were checking out my RV. I have a Bluegrass sticker on the back. I had my shirt on and that took care of intros immediately. The one guy has been playing for 47 years..."
4. SCOUT THE CAMPGROUNDS AT BLUEGRASS FESTIVALS. Stroll the campground at different times, especially when the stage shows aren't on. If you notice a group playing at about your level, you can check your instrument's tuning and join in from a bit outside the circle. Chances are, if you sized it up right, you'll be welcomed in, perhaps obviously, perhaps not. If you don't see a group you'd like to fit in with, you and one other person, or even by yourself, can start playing in a fairly visible spot. If someone walks by with another instrument, you might invite them to play a tune, or they might invite themselves. If you get into a conversation, find out where they're from and are there any good jams there? If not, you can always start one. 5. START ONE. It helps to know how to jam, but even that isn't necessary if you can get a few more experienced people to come, or even pay for a teacher's presence. Only requirements are: invite some pickers (or potential pickers), give directions to your house (or a public park, or wherever) maybe have some refreshments, definitely a tuner and a songbook or two with a music stand handy. Then, as soon as someone starts singing and playing some rhythm, someone can join in, and the jamming begins! 6. INDEX CARD ADS ON BULLETIN BOARDS at music stores, college student unions, community centers, etc. might make some connections. Word your ad to include what your instrument, if you sing, where you live, your jamming experience, and maybe your age group if that's relevant. 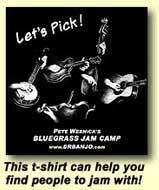 You might advertise for just "bluegrass" jamming, or possibly "bluegrass/folk/country". For you folks in the U.S. who think "no one near you is into bluegrass", it's my guess that you're mistaken. In the following case, he is quite likely correct. U.S. bluegrassers, consider yourself fortunate! On my web site, you'll find several suggestions for finding others to play with, usually based on the understanding that there probably folks around that you don't know about. You might try those first, as they just might work. But in your case, there really might be no pickers and bluegrass within 500 miles! This calls for drastic measures, which is that you have to get people interested. If you can get a friend interested in playing bluegrass (or any type) of guitar, you can soon be playing music with that person. There is basic guitar teaching available with books, videos etc., but the main thing is to learn chords well enough to simply chord behind songs. With a flat pick, a person may be able to go boom (bass note) / strum in a matter of days. You take it from there. Try introducing bluegrass recordings to various friends. You never know who might already be interested! If they are interested enough to surprise with a guitar, you could have a picking partner later that week. As I said, you take it from there. I have done such things with other people, and it has paid off. Here's Gary's update from several months later! Thanks for the words of encouragement. i must apologize, but i have been so swept up in this jam thing and practicing that i neglected to thank those that have helped me get to where i am. Some more than others, but none more than yourself with your books, video's, web site and personal input. For that i thank you Pete. massive bow in the neck. After he had several local "experts"
peghead. Once again, thanks to your site and Silvio Ferreti. she agreed to play some bluegrass songs. parents plays mandolin. They wanted to join us. The kid's violin teacher heard and wanted in as well. Now a fella who plays drums comes along. I realise that it's not strictly bluegrass but he does help keep time and he has fun. songs and taking your advice and singing a bit too. We are having a great time and try to meet up once a fortnight. We have been asked to play at a local event and although we declined on this occasion ( we are too out of time yet ) i have no doubt we will play at others in the future. I'm quite happy to just jam along. sounds really fast. How do you do it". Once again Pete, thanks for the encouragement and advice. Just a quick note. One of the local markets has its opening for the "dry season". They are expecting a few thousand through the gate. I've been asked if I would like to do a guest appearance and play a couple of songs. So a big thanks to you Pete for your instruction material, your words of advice and your encouragement. I'll let you know how it goes. I hope one day you can visit the Northern Territory. Cheers for now.